The unexpected death of Boris Berezovsky has moved his relations with the Belarusian authorities into the spotlight. Over the past 15 years Boris Berezovsky regularly appeared in Belarusian politics. Analysts are even discussing a possible friendship between Boris Berezovsky and Alexander Lukashenka. In the 1990s, Berezovsky persuaded Lukashenka to release Russian journalists from Belarusian prison. In the 2000s, he recommended that Lukashenka hire British PR guru Lord Timothy Bell and persuaded him to imprison an American lawyer representing the interests of a relative of deceased Georgian billionaire Badri Patarkatsishvili. Berezovsky supported Lukashenka under the most challenging circumstances. After the 2010 presidential elections in Belarus, he claimed that Russian intelligence services had provoked the violent crackdown on pro-democracy protestors in Minsk and that the Russian ruling elite was responsible for failures in Belarus-EU relations. The first formal meeting between Berezovsky and Lukashenka took place in Minsk in 1997. At that time the Belarusian authorities had detained the TV crew of Russian Public Television and put them in a Hrodna prison. The Russian TV channel controlled by Berezovsky was well-known for its critical reports about Lukashenka. To demonstrate his influence, Berezovsky came to Minsk with a group of Russian media executives. After a meeting with Lukashenka, Berezovsky publicly condemned the position of the TV channel toward Belarusian officials and as a result the authorities released the journalists. According to Aliaksandr Fiaduta, who wrote a biography of Alexander Lukashenka after that meeting, mutual understanding between the Belarusian president and Boris Beresovzky has always been very good. The next official meeting occurred in 1998. Berezovsky came to Minsk as an executive secretary of the Commonwealth of Independent States (CIS). The Belarusian ruler warmly greeted him and their meeting lasted over two hours, instead of the intended one hour. They were negotiating the prospects of the CIS, and the Belarusian leader even proposed that Beresovsky settle in Minsk. Subsequently, The Daily Mail reported that Berezovsky had purchased property in Minsk. After Berezovsky fell from the grace of Vladimir Putin and the Russian authorities initiated the first criminal case against him in 1999, the Russian oligarch held no official meetings with Lukashenka. Nevertheless, the Russian media regularly reported on meetings between the two friends. Since then, appearances by Boris Beresovsky in Belarus have become somewhat of a mystery. Some members of the Belarusian media now speculate that Berezovsky organised the escape of the former head of the National Bank of Belarus Tamara Vinnikava from house arrest in Minsk. She is now living in London and has political refugee status. Tamara Vinnikava denies any involvement by Berezovsky in her escape from Belarus. But in the Ukraine-published Writings of Major Melnichenko, the former president of the Ukraine Leonid Kuchma and the head of his security recalled “how they released Vinnikova from Ukraine with the support of the British”. This made journalists think that this story could involve Berezovsky. In the 2000s, Berezovsky on several occasions publicly complimented Lukashenka. In turn, the Belarusian president confessed that it was Boris Berezovsky who advised him to hire Lord Timothy Bell, a British peer and a former aid to the former UK Prime Minister Margaret Thatcher. For several years Timothy Bell performed public relations work for the Belarusian government. Another story which make Berezovsky's connections in Belarus evident was the arrest of Emanuel Zeltser – the lawyer of one of the relatives of the deceased Georgian billionaire Badri Patarkatsishvili. Zeltser represented Joseph Kay, American businessman and stepbrother of Badri Patarkatsishvili. Berezovsky and Kay fought for the assets of the Georgian billionaire. Berezovsky was a long-term business partner of Patarkatsishvili and claimed a part of Patarkatsishvili's money. The Georgian tycoon invested in Belarusian refineries. The Belarusian authorities may also have been an interested party in the division of his inheritance. The US citizen Emanuel Zeltser flew to Minsk on 12 March 2008 in a plane owned by Boris Berezovsky. Just after the plane landed, Belarusian intelligence services arrested the American lawyer. They accused Zeltser of forging documents and industrial espionage. As a result, a Belarusian court sentenced Emanuel Zeltser to 3 years in jail. According to the American lawyer, Berezovsky appeared at the closed trial as a witness. When the lawyer of Emanuel Zeltser pointed out that Berezovsky was wanted by the Russian authorities, the judge paid little attention. Zeltser also claims that Berezovsky several times threatened him during his visits to the Belarusian prison where he was kept. Zeltser spent 15 month in Belarusian prison and the Belarusian authorities released him only after a group of American congressmen visited Minsk. According to independent analysts, Zeltser’s arrest in Minsk helped Berezovsky to divide the assets of Badri Patarkatsishvili. Boris Berezovsky claimed that the Russian authorities benefited from the events of 19 December 2010. That was the day of presidential elections when the Belarusian authorities surprised everybody by brutally dispersing a peaceful demonstration in Minsk. Hundreds were beaten and arrested, including nearly all presidential candidates (one still remains in prison and two others had to go into exile). Russia can exercise an unlimited influence in this country and essentially they pushed Belarusian authorities into a corner. For the last three years Lukashenka has consistently moved in the direction of democratic reforms. Some even rumoured that during the 2010 election campaign Berezovsky sponsored the Belarusian opposition. But the contacts of Berezovsky with Minsk in 2008-2009 indicate the opposite. Berezovsky played a significant role in contemporary Belarusian history. Opposition to Vladimir Putin united the exiled oligarch with the Belarusian ruler for almost 15 years. Much remains unknown about the interests of what was once the most powerful Russian oligarchs in Belarus. What seems clear is that Berezovsky's opposition to Putin led to a remarkable fall from the height of being the most influential oligarch in Russia to suicide in exile. Playing the role of the most loyal ally of Putin in the West, Lukashenka hopes to remain in power for much longer. Belarusian experts discuss migration, philosophy of barricades and coexistence, urban development and the readiness of the official Minsk to start another cycle of the Belarusian-European relations among other issues. 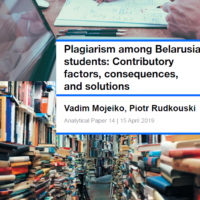 Human Capital: Leave Cannot Stay – BISS paper examines migration and immigration attitudes of Belarusians in the light of sociology. The study is based on the results of a fresh national survey (December 2012 – January 2013). One of the preliminary findings does not prove an assumption that most Belarusians want to leave the country – this figure is comparable to 2009. At the same time disproportionate big number of those who wish to leave Belarus for permanent residence are people with higher education (mainly specialists in economics), and of high social status. From Philosophy of Barricades – To Philosophy of Coexistence – sociologist Oleg Manaev in his interview for Mediakritika.by tells about the nature and focus of the complex processes taking place in the Belarusian media. In particular, Manaev considers that division of Belarusian nation into two groups with different values and understanding of reality is historical and is unlikely to disappear any time soon. Nevertheless, “we need to transition from the philosophy of barricades to the philosophy of coexistence with each other. After all, we are one nation – Belarusians”. Compaction in a Black Way – Denis Kobrusev, European perspective NGO, provides in-depth analysis, how a scheme of compaction and urban conflicts occur in Minsk: how developers find a necessary piece of land, how the area is trimmed and what is being done to ensure that citizens are legitimately unable to protect their own interests. The author illustrates his arguments by specific fresh case studies of buildings in Minsk. 2012 Results: Andrei Pachobut is an Absolute Civil Society Champion – the Assembly of NGOs summarised the results of the CSOs awards ceremonies held in the year 2012 and found out that Andrei Pachobut, a journalist from Hrodna, became an absolute civil society leader. He was named the journalist/civil activist of the year five times: the Young Front, the Assembly of NGOs, the Svetlana Naumova’s, Human Rights Alliance’s and the newspaper’s “NashaNiva” awards. The Conservative Revolution: Breakthrough to the Past – Alexander Adamyants, Center for European Studies, continues to debate between liberals and conservatives. In his article, the author presents the dispute as a competition of ideas about the present and future of Belarus. The expert believes that the current conservative futurism is a breakthrough in the past, in a bygone era which has only of historical-philosophical sense, but nothing more. Civil Society in Post-Soviet Europe: Seven Rules for Donors – The west's contribution to building more democratic and open societies in the post-Soviet region leaves much scope for improvement. Orysia Lutsevych at Chatham House draws lessons and offers recommendations – pillars – to both public and private donors. Namely, the author suggests make citizens "actors for change" not "consumers of democracy assistance". Position Paper on European Dialogue on Modernisation with Belarus – the Coordinative Council of the Belarusian National Platform has produced a position paper on the European Dialogue on Modernisation with Belarus. In their paper the authors express their position on the current status, problems and prospects of the Dialogue. They reaffirm their full support for the Dialogue, but draw attention to the need to make changes. Nashe Mnenije – 10 years. Expertise as a Cure for Boredom – in 2012 an online project of the Belarusian expert community Nashe mnenije celebrates 10 years. The authors of the portal discuss the most important events in the history of the project. They also talk about the features of the Belarusian expert community. In particular, the experts believe that there are no more than 300 publicly employed analysts in Belarus, including New Europe and other editions, as well as such institutions as Political sphere, BISS, BEROC, etc. BISS Trends #12 – BISS presents the 12th issue of the BISS-Trends quarterly monitoring of main trends in political, economic, legal, geopolitical and cultural spheres. From now on, semiannual BISS-Trends together with monthly BISS-Timeline issues will replace the BISS-Trends quarterly format. In the fourth quarter of 2012, the experts noted the continuing stagnation or regression as regards virtually all the trends considered. Social and political life was only slightly enlivened by the parliamentary elections, and stagnation continues here. ABC. Political Review # 1, 2013 – Analytical Belarusian Center presents its first Political Review in 2013. The paper examines proposals on changes in the electoral law; the process of coalition building of the opposition forces; and the readiness of the official Minsk to start another cycle of the Belarusian-European relations.